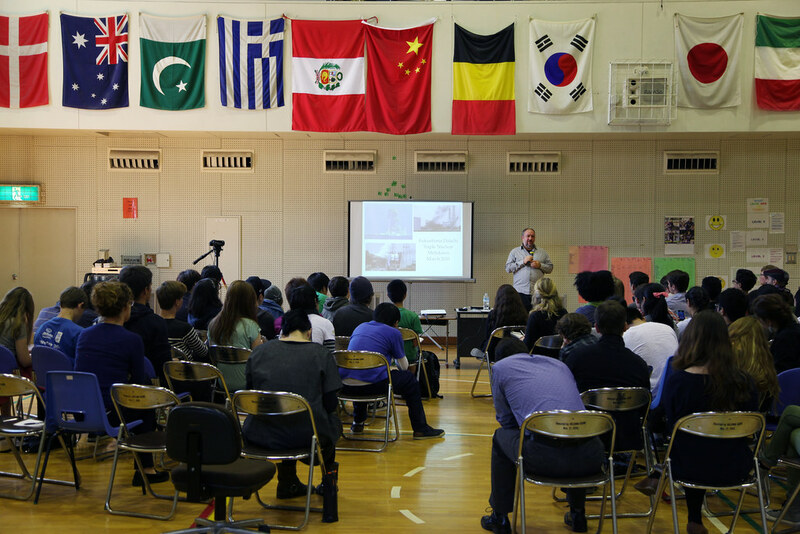 On April 2nd, 2014, the students of TGS and Hiroshima International School played host to noted historian and author Dr. Robert Jacobs for a discussion on the grave realities surrounding nuclear fallout in Japan and the rest of the world. The lecture supplemented a unit of study called “Graphic Novels for Change,” which was a collaboration across TGS and HIS to help students utilize their storytelling abilities to be agents of change against atrocities all over the world. On top of his work as a historian and author, Dr. Jacobs is also an associate professor at the Hiroshima City University’s Hiroshima Peace Institute, a research institute which aims to contribute towards nuclear abolition and the realization of sustainable global peace. He is also the leader of The Global Hibakusha Project, the work of which will be discussed below. Close to 70 years have passed since the Little Boy atomic bomb was dropped on Hiroshima, and while the city has been able to recover physically and quintuple in population, lingering social scarring is still evident. The Japanese have a term for the survivors of atomic bombings, Hibakusha, and much of Dr. Jacob’s work now focuses on linking these communities around the world. 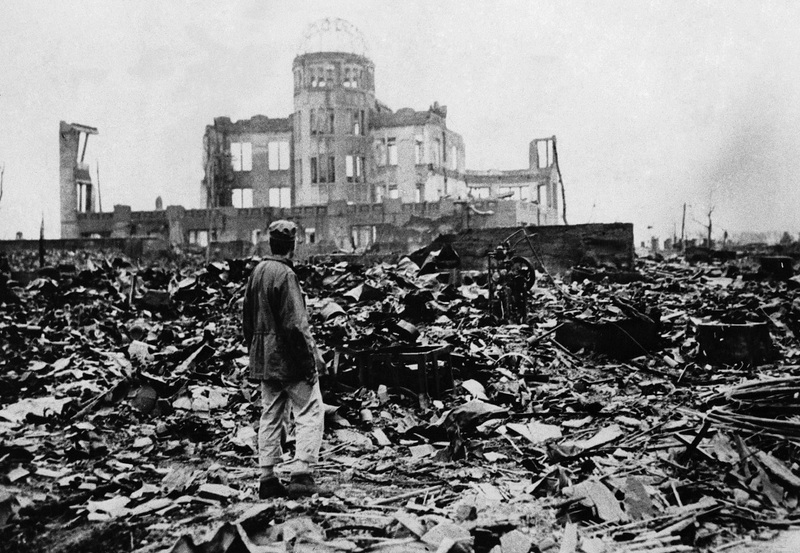 For many of the Hiroshima survivors, the trauma of the attacks has proven inescapable; not knowing when and if you will die from exposure to radiation and the social burden of not being able to marry or have children are both legitimate ongoing consequences stemming from America’s actions during World War II. Dr. Jacob’s work with the Hibakusha also extends well outside of Japan. Since the bombings of Nagasaki and Hiroshima occurred in 1941, there have been over 2,000 nuclear tests conducted around the world — 541 of which took place above ground. These tests are often carried out by developed countries in areas under their colonial control: England in Australia, Russia in Kazakhstan and France in Polynesia are all examples of nuclear tests which have carried catastrophic results for the indigenous populations. Many of these tests have resulted in entire communities being displaced and forced to live as refugees in foreign lands –Hibakusha discarded like unwanted trash. It isn’t just planned nuclear blasts that result in Hibakusha, however; the limitations in nuclear safety have been demonstrated multiple times over the last thirty years, with notable meltdowns occurring at Three Mile Island, Chernobyl and more recently, the failure at the Fukushima I Nuclear Power Plant in 2011, which resulted in the evacuation of over 300,000 residents. The true extent of this contamination will not be known for years, but the cry of “No more Hibakusha” is now more prominent than ever. Hiroshima, in particular, has a very vocal anti-nuclear movement, of which Dr. Jacobs is very much a part. For ease of viewing, Dr. Jacob’s talk has been broken down into sections, which you can find below. You can follow Dr. Jacob’s on Twitter at @bojacobs, and to learn more about THINK Global School’s own Tohoku documentary project, visit here.